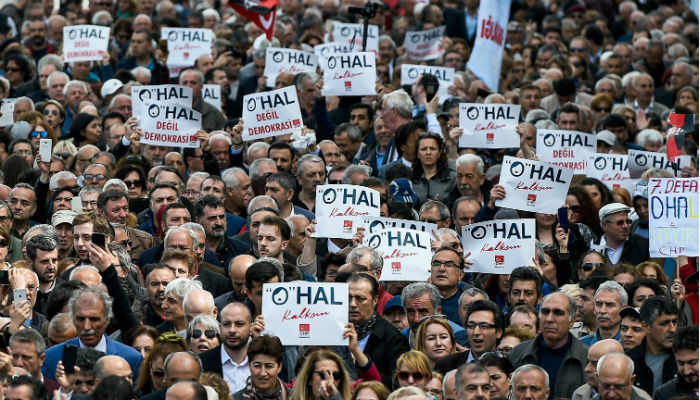 Thousands of people affiliated with the main opposition Republican People’s Party (CHP) held a sit-in in İstanbul’s Taksim area on Monday protesting government plans to extend a state of emergency, known as OHAL, which was declared following a failed coup attempt in July 2016. Police teams prevented the crowd from entering Taksim Square, forcing the group to gather on İstiklal Street. Emergency rule was declared for three months on July 20, 2016. It was extended for another three months on Oct. 19, 2016, Jan.19, 2017, April 19, 2017, July 21, 2017, Oct.16 2017 and Jan.18, 2018. CHP İstanbul deputy Mahmut Tanal, who was among the participants of the protest, said the independent judiciary and media in Turkey have been destroyed during the state of emergency. “During the Nazi era in Germany, the press didn’t write anything other than what the government said. There are now innocent students who are in jail. There are teachers who have been removed from their posts. OHAL is the enemy of democracy. OHAL brings injustice,” said Tanal. Under emergency rule, the government has pressed ahead with many controversial decrees that have the force of the law and are not required to be approved by Parliament. In line with these decrees, more than 150,000 people have been purged from state bodies on coup charges.